Indulge in a day's Fishing in Auckland. With two harbours, deeper waters beyond, and great inland saltwater waterways, all kinds of fishing is catered for here. You can fish independently, or join a charter to get you to all the best places. Auckland Fishing splits into three main types. 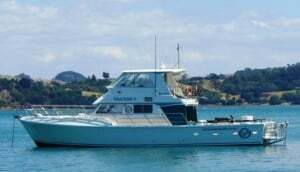 Go big game fishing out in the Hauraki Gulf or up to the Bay of Islands, and try and reel in some tuna for tea. There are some luxurious charter boats to be be had, all with great facilities. Most have food and drink provided, plus entertainment and plenty of down time so you can just enjoy the weather and scenery, between catches. Trips can be hourly, half, full or multi-day. For smaller fish, try salmon and trout fishing with some specialist fishing companies that can take you to all the best places for the whole day. For some saltwater inshore fishing, you can start at Waitemata Harbour and hunt for snapper, then head inland and see what else you can reel in. Fishing in Auckland is big business, so you won't have a problem finding a professional to take you out in their state of the art boat. The longer, scheduled trips, especially, are well worth checking out, for some of the best fishing in the country.